DropBox is one of the best Online Service to storage data and even better you can access the data from anywhere. The Service is free and totally reliable, despite that it has a lot of privacy and security, when it comes to the pro level, it is still far behind. I mean if someone wants to keep some folder in the Computer, he can use the Selective Sync Feature, but the problem is that anyone who will use that computer can have the access to those folders too. The main reason why Office Workers must have Two DropBox accounts, One for Office Use and One For Personal Use, Yeahhh!, the problem is solved, well not exactly, you can’t just add Two different Dropbox accounts in a Single App. The Official app allows you to add only one account at a time, so how to use more than one account at the same time, the answer is quite simple. 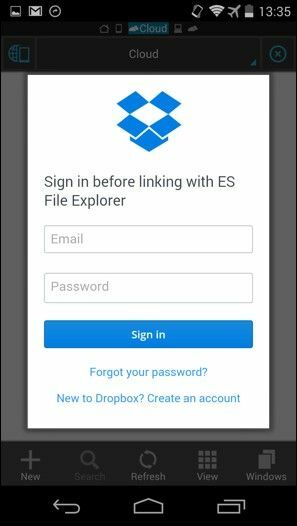 ES File explorer is no doubt the best File Explorer of all times, and we will use this amazing app to add more than one DropBox account. Launch the App and Tap the Phone + Network icon on the Left side. 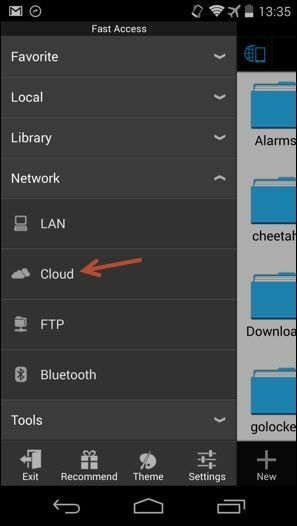 A Side bar will pop-up, Select Cloud from there. Now in the New Screen, Tap the + icon in bottom left. A Pop-up with DropBox login screen will appear.